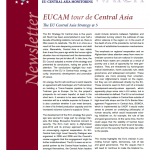 The EU Strategy for Central Asia is fve years old. Much has been accomplished in over half a decade of building relations, but even so, there is little reason to celebrate. The EU is in crisis as a result of the ever-deepening economic and debt crisis. Meanwhile, Central Asia is less stable than it was fve years ago while the human rights situation has not improved and the democratisation process has yet to take off. In late June, the EU Council adopted a review of the strategy and presented its conclusions, noting ten points for attention. The conclusions highlight four main interests of the EU in Central Asia: energy, security, (economic) development and promotion of values. On energy, the EU will continue to work towards an agreement with Azerbaijan and Turkmenistan on building a Trans-Caspian pipeline to bring Turkmen gas to Europe. So far, the project’s prospects do not seem hopeful, at least in the short term. It remains to be seen whether Turkmenistan will be a reliable exporter to Europe. It is also uncertain whether it can meet demand, in view of its limited production capacity and the increased volumes it plans to supply to China. The development of the EU’s strategy fve years ago was spurred in large part by energy interests. But today, Brussels’s foremost concern is security. The EU’s main worry is Afghanistan post-2014 and its primary approach is based on encouraging regional cooperation. An EUCentral Asia High Level Security Dialogue was organised in 2008 and 2009 and the Council’s review suggests that this engagement might be further institutionalised. The EU is seen as an impartial partner by the Central Asian leaders, but amongst themselves, the Central Asian leaders have many differences and much personal resentment. With the best of will, the EU is unlikely to succeed in brokering comprehensive deals on sensitive water management issues or on post-2014 Afghanistan. Trying to bring Central Asian leaders around the table and talking about ‘common threats’ is useful, but the EU needs to start thinking about how it will react if destabilising circumstances arise. These circumstances could include tensions between Tajikistan and Uzbekistan turning violent; the outbreak of new ethnic violence in the region; or, in the event of the death of one of the presidents, turmoil due to the lack of established succession mechanisms. The emphasis on regional cooperation and on Afghanistan takes attention away from more immediate concerns that are national in character. Central Asian states are unstable as a result of poverty and a lack of opportunity for new generations. They are threatened by home-grown radical islamisation, harsh autocratic rule, weak governance and widespread corruption. These problems are more pressing than uncertainties over Afghanistan’s impact on the region, but they are not addressed directly by the EU. These concerns seem to form part of a broader development-security-values approach, which apparently plays some role in EU action, but is not elaborated or defned. The EU is not involved in hard security matters in Central Asia outside of high-level talk shops and the EU’s Border Management Programme in Central Asia, BOMCA, which is implemented by UNDP. It would make sense to present an underlying philosophy of human security, which could incorporate existing initiatives on, for example, the rule of law and good governance. At the same time, the EU could argue that the stability of Central Asian states largely depends on their level of development and on the security that the state can offer to the people. The review highlights the EU’s interest in promoting human rights, democracy, rule of law and good governance. The EU argues that it will need to ‘continue to make the bilateral human rights dialogues more results-orientated taking into account best practices [and] encourage democratic reforms and the development of national democratic reform agendas and support implementation by sharing EU experiences.’ Making human rights dialogues results-oriented and moving from an exchange of views to concrete outcomes would indeed represent a step forward. The EU must also make sure that the process is not separated from high-level political dialogues and sectoral policy processes. The fact remains that the human rights situation in Central Asia has not improved over the last fve years. No country has a reform agenda focused on democracy, apart from Kyrgyzstan to some extent. Does the EU intend to bet on Kyrgyz democratic development or does it plan to work also on democracy with the other four republics, which are all authoritarian and show no intention of seeking democratic reform? Confronting these regimes on democratic reform will be diffcult and it would need to be backed up with a more forthright approach towards Central Asian regimes. The world has changed over the last fve years, including in Europe and Central Asia. But the EU believes its strategy is still valid. Concrete new initiatives are few, and there have been neither substantial readjustments nor efforts to link specifc strategy objectives to available funding. This is a missed opportunity. The EU has built relations and is working with and in Central Asia. But it will have to rethink what tangible achievements it hopes to obtain in the felds of energy, security and development, including its normative approach. This newsletter seeks to explore the link between security and development. 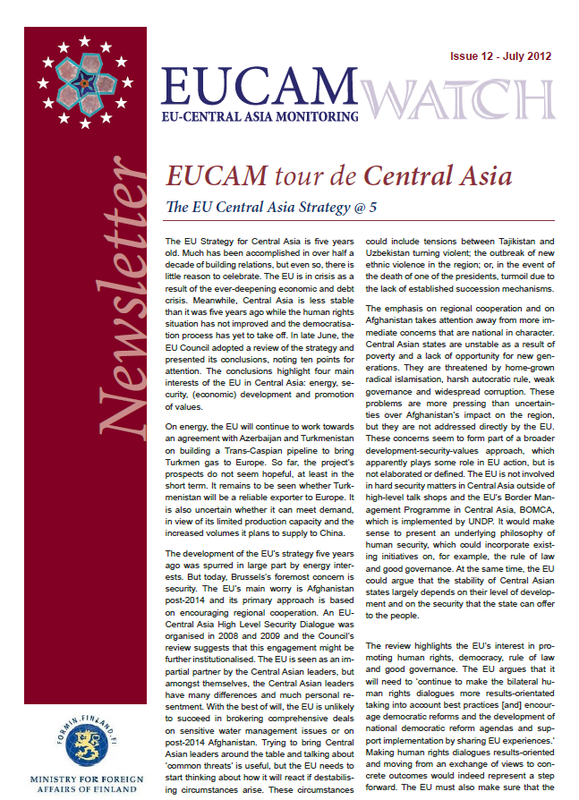 During our tour de Central Asia last May, we asked fve experts affliated with EUCAM to discuss how they see the link between security and development in Central Asia, and this issue includes short interviews with our experts. It also presents accounts of the three seminars we organised in Almaty, Dushanbe and Bishkek as part of the EUCAM-SD project, funded through the Wider Europe Initiative of the Ministry of Foreign Affairs of Finland. Next articleMongolia’s Quest for Third Neighbours. Why the European Union?